When we look at all of the products in our dental practice that are on a reorder week after week, disposables are at the top of the list. Dental Assistants are very picky about what disposable products they use, and only the best will do. Disposables by Richmond Dental and Medical are products that many DAs know and trust. The soft texture and lint-free surface of the non-woven sponges result in exceptional fluid absorbency. 2"x2" sponges are the first dental product every dental assistant learns to handle when they begin their training. When dental assistants are asked if what type of sponge they prefer to use, more than 67%, choose non-woven because they do not leave fibers behind on the surfaces they wipe. 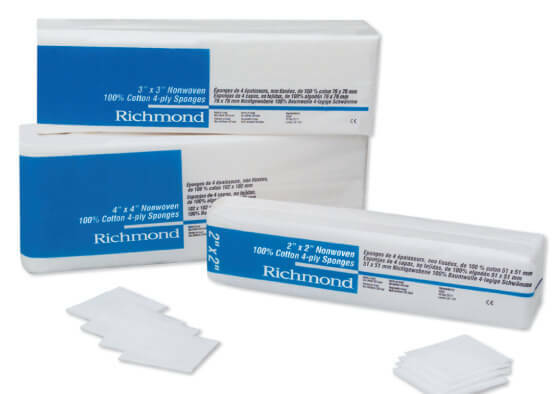 Richmond Dental and Medical's non-woven sponges are available in several sizes including 2"x2", 3"x3", and 4"x4". While taking impressions you can open up a 2"x2" sponge and place it in the vestibule area to keep the lips and saliva off the teeth. Wiping dental instruments such as explorers, spatulas, and hands mirrors. Utilizing them as a gingival barrier when doing whitening procedures by connecting the liquid dam to the cotton non-woven gauze to prevent burning of gingival tissue. The EZ UP™ Pellet Dispenser is a must-have for every practice that uses cotton pellets for their dental procedures. No more pain when it comes to grabbing cotton pellets without success. The new EZ UP™ dispenser has a pop-up spring that pushes the cotton pellets to the top with ease. Designed with two different screened grids for easy removal of the desired cotton pellet size. Richmond Dental and Medical Cotton Pellets that are sizes 1 and 2 use the large grid, and cotton pellets that are size 3 to 5 use the small grid. The holder itself is white, and has a sliding top that secures the pellets in place. The body of the EZ UP™ Pellet Dispenser has a stainless steel non-skid bottom for better grip on dental unit desktops. The EZ UP™ Pellet Dispenser also provides a safer, cleaner environment for the dental assistant and patient. The dispenser is easy to assemble; just separate the foot part of the unit from the pellet tube and turn it upside down. Then choose the appropriate grid size and slide it into the collecting tube. The collecting tube comes assembled with the smaller grid already in place. 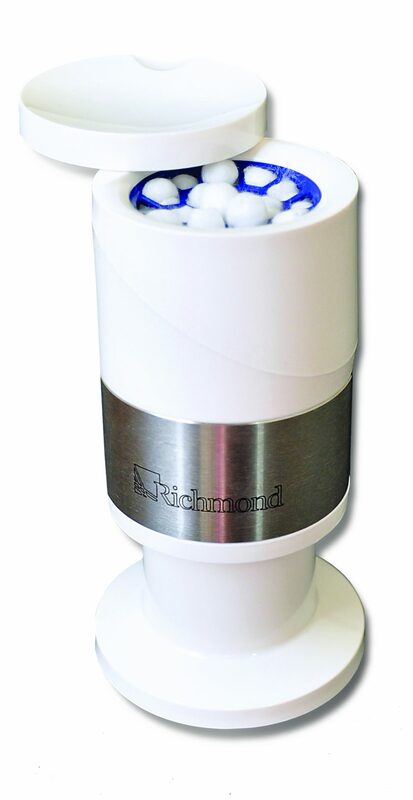 The EZ UP™ Pellet Dispenser by Richmond Dental and Medical is an innovative must for dental assistants.